You do not have to be a follower of my blog or become a follower, although if you like my blog I hope you will! You can follow by email or by RSS (see buttons in the side bar on the right at the top). You need an address where bookdepository will deliver. Leave a comment to say you’d like to win the book. You can enter the giveaway until Sunday April 12th. I will close the giveaway when I turn on my computer on April 13th (Netherlands time). I will notify the winner by email. The winner need to answer my email within 3 days, or I’ll announce a new winner. Now go to the other blogs and try your luck! Click here to view the list with participating blogs. 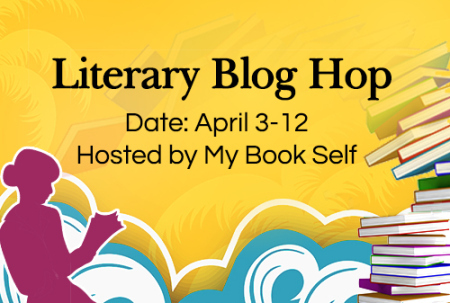 The Literary Blog Hop is organised by The Blue Book Case. It’s a monthly event for blogs that discuss primarily literary fiction and classics. Hop over to The Blue Book Case if you want to join in! How do you find time to read, what’s your reading style and where do you think reading literature should rank in society’s priorities? My answer: The short answer on where I find the time to read is that I don’t work or study. In principle, every day is for my to fill in as I like. In practice, there is a household with 2 teenagers and a husband to take care of, although that doesn’t take all day. So, I fill up the rest of my time with other activities, like blogging, exercise, socialising, etc. As a rule, I don’t read much during the day. Just as I never watch day-time television, I don’t sit down to read. Except: I read at all meal times, at “coffee break”, and sometimes I steal an hour during the day when I have a book that needs to be finished soon. Mainly, I read in the evening. Because by then I’ve already done all the chores that working people need to do in the evenings, I can spend evenings (and weekends) reading. That’s the secret behind me reading so much! My reading style: fast, faster! When I have a great book in my hands, I want to read it with great speed. If I have a not-so-good book, I want it finished soon, too. 🙂 What bothers me, are some literary books that you can’t read fast. I dislike them for slowing down my reading and I love them for being written so well. Mixed feelings! In general, if a book takes longer than 4 days to read, I’m getting restless. As far as society is concerned, I think it’s great when people read at all. Just taking out quiet time to put your nose in a book sounds like a good idea for everyone. I think it’s a pity lots of people get stuck in simple romances that are (for them) brain candy but don’t stretch them in any way. Still, reading those is better than nothing! 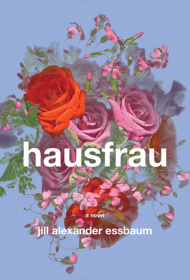 I would like it if people were shown some slightly more demanding books, under the guise of “If you like this book with the half-naked man on the cover, you might also like to read this book set in the 1960s in which Jane finds herself with a lover who seems to good to be true” (I made up that last bit). But what I mean is: a bit of encouragement and showing people some other books would be good. I think World Book Night does that a bit, but a few of the books there will still be way too intimidating for a lot of people. What about you? Do you recognise this in your own reading? The Literary Blog Hop is organised by The Blue Book Case. It’s a biweekly event for blogs that discuss primarily literary fiction and classics. Hop over the The Blue Book Case if you want to join in! My answer: I would love to visit Alaska! I’ve read a few books in the last year or so that took place there and I think the nature must be so beautiful, rough, and scary, too. It can be a lonely place but where there are towns, I imagine the people to huddle together to face the bitter cold in winter. Most recently I read Sukkwan Island by David Vann, in which a father and son try to survive for a whole year on an remote Alaskan island. I read Raven Stole the Moon by Garth Stein last year. Here, a woman goes back to Alaska where her family comes from, which (literally) is a magical place. And before my blogging life, I read Into the Wild by Jon Krakauer in which a man tries to survive on his own in the Alaskan wilderness. Now I want to sample it for myself! East is East by T. C. Boyle – Very well-written book about a Japanese sailor (with an unknown American father) who illegally enters the US at Georgia, near an artists’ colony. One of the writers sees a good story in him and hides him in her cabin. Sukwann Island by David Vann – Another very well-written book. A divorced man takes his 12 year old son to the Alaskan wilderness, to spend a year there living off the land. That is a lot harder than they thought. Recommended. Join the Literary Giveaway Blog Hop (February 19-23). Give away a (literary) book or book related item and link to other bloggers who are also holding a giveaway. Lots of blog traffic, lots of readers, lots of fun. Enter as a participant now. And did you notice the “Literary” bit?